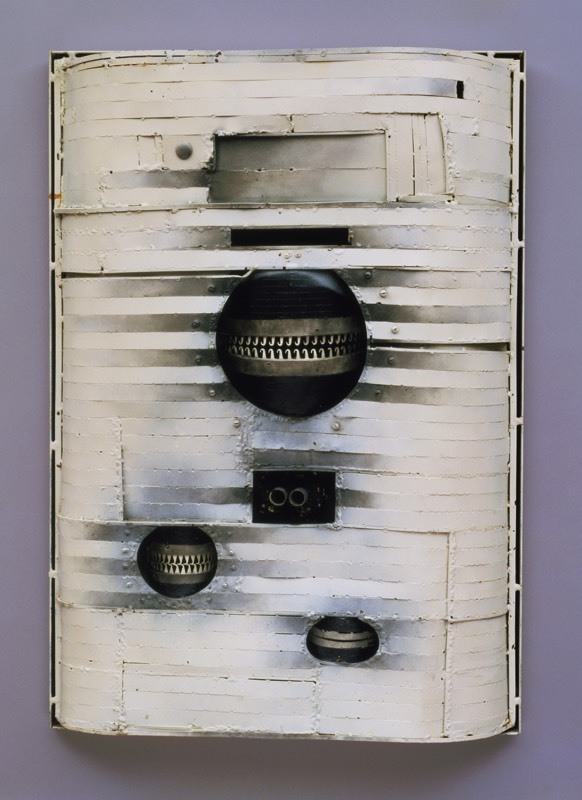 Lee Bontecou first earned attention in the early 1960s for sculptures that incorporated a range of materials—including metal, canvas, denim, tarpaulin, epoxy and fiberglass. Her wall reliefs, all of which are untitled, offer many dualities, including their ability to be viewed simultaneously as painting and sculpture. 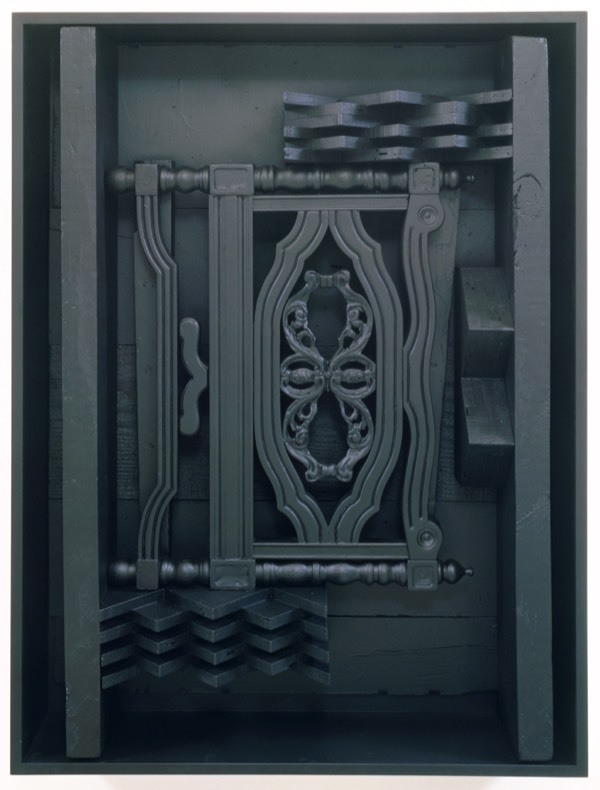 This work belongs to a group of painted metal compositions comprising Bontecou’s Prison series. It was constructed at a time when the artist was attaching conveyor belts and discarded canvas from the laundry underneath her Lower East Side New York City studio to metal frames. The deep voids and menacing elements in Bontecou’s sculpture are associated with the artist’s coming to age during World War II and habit of listening to Cold War era short wave radio broadcasts as she worked. 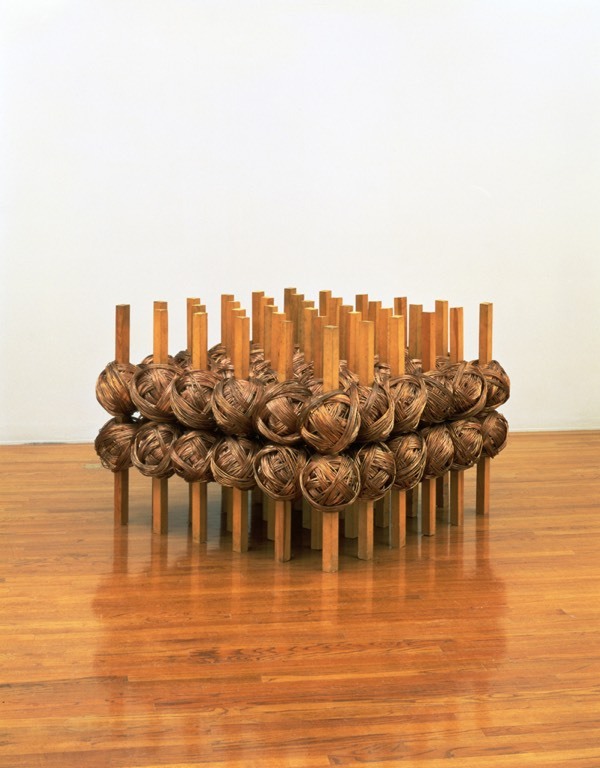 Her materials are industrial, but the sculptures also have human references, with round holes suggesting orifices and garment racks rows of teeth. These features appear confined or entrapped by the taut flattened surface and the black and white stripes are akin to prison apparel—characteristics shared with other sculptures Bontecou was making at this time. From 1960 to 1974, Lee Bontecou exhibited with Leo Castelli in New York City. Castelli donated Untitled to the Akron Art Museum and a similar, larger sculpture by the artist to New York’s Guggenheim Museum. 49 ¾ x 39 x 9 in. 34 ½ x 51 x 51 in.